Since both clocks and globes have rotating parts, gifted craftsmen through the years have sometimes mixed the two together, producing a fascinating marriage of cartography and horology. 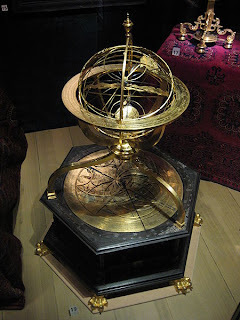 Early combinations of time-trackers with globes (armillary spheres) were used not for showing earthly locations but as devices for studying astronomy. 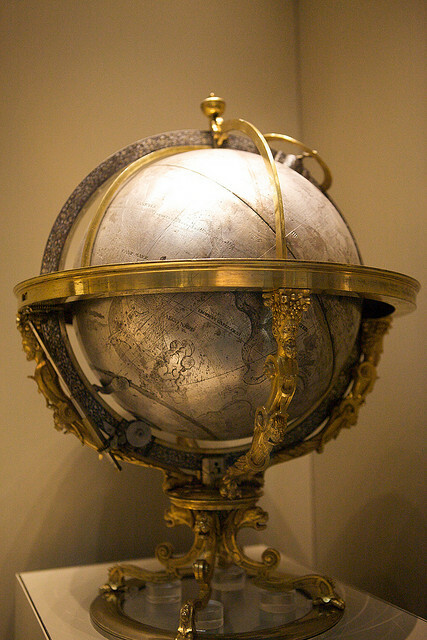 Celestial globes, on the other hand, were globes for mapping the heavens – still an astronomical device. Why were the earliest globes celestial globes? It's because the ancients were all in agreement about the celestial sphere – that the heavenly bodies were embedded in a crystal sphere rotating around the earth, while in contrast, there were times when people thought the earth was flat. Plus, it was easier to observe and plot the movements and positions of the stars than it was to travel around the world and map it onto a globe. When clockwork was invented (some say hundreds of years before the common era – as evidenced by the Antikythera Mechanism), clockwork mechanism was then applied to models of the solar system, to armillary spheres, astronomical clocks and then to terrestrial globes (as soon as most people caught on to the fact that the earth was also a globe). Clockwork quickly advanced in complexity – becoming marvels of mechanical engineering such that, by the 16th century, combination armillary spheres and astronomical clocks not only told the position of the sun, stars, and planets at any time of the day, they also told the date of the year. 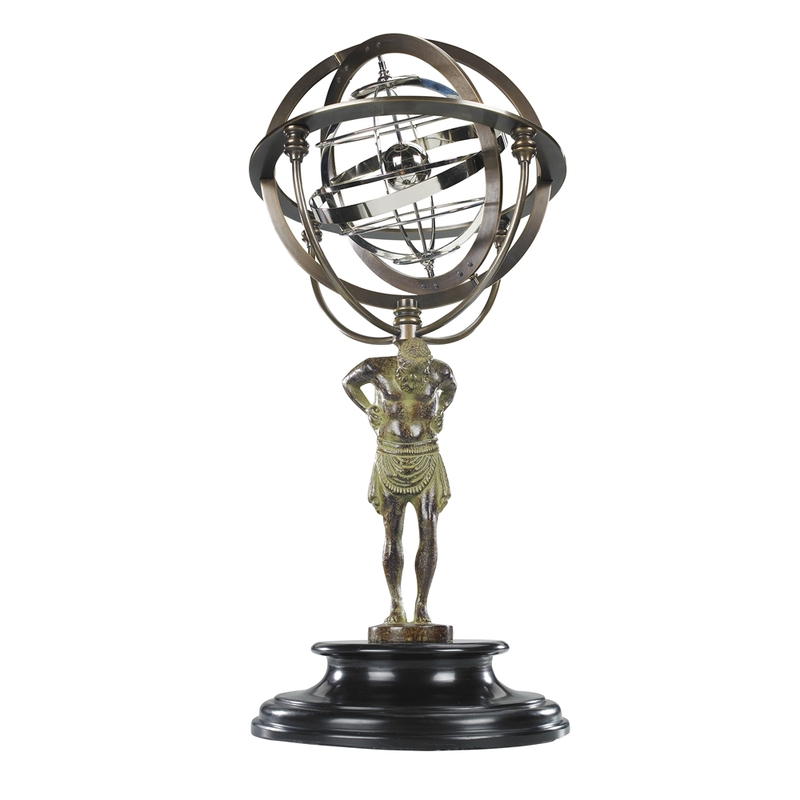 Armillary sphere with astronomical clock. But it was not only watches that were taken into orbital space. 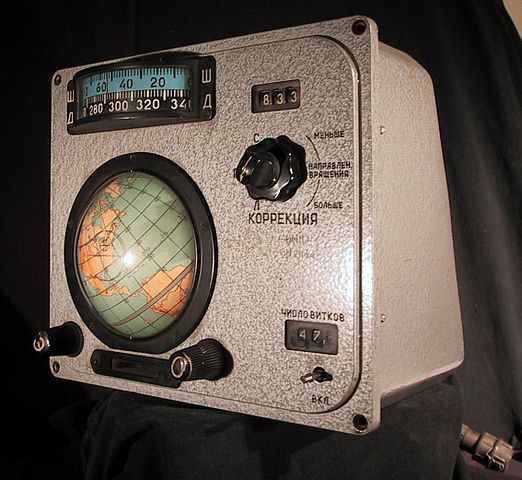 Clockwork globes that told astronauts their current location over the earth were used as navigation instruments. These were very complex mechanical computers. The Russian version was called Globus IMP. A more fancy desktop version will also show streets, weather, night and day, earthquakes, volcanoes, and hurricanes. Then there's the probably most popular virtual globe: Google Earth. Gracefully intertwined silver rings represent trajectories of heavenly bodies around the Earth in the Atlas 18th Century Armillary Globe. Unlike anything you've ever seen before, this one of a kind globe represents Atlas, who was one of the legendary Titans that battled the great and mighty Zeus. 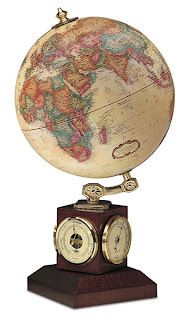 Three precision weather instruments, including a thermometer, barometer and hygrometer, lend beautiful utility to the wooden cube base of this highly functional and endlessly fascinating globe. Now you dont have to search high and low to find out the weather – just take a look at your globe! Each gemstone globe is handcrafted and one of a kind with each country represented by a hand-carved semi-precious stone as well as the seas & oceans depicted by the main color and type referenced above. 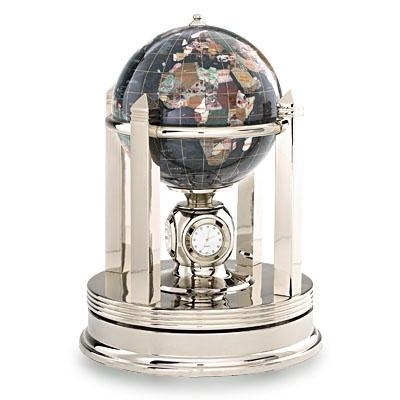 If you've been looking for a globe that showcases the beauty and splendor of the Earth using Earth's very own materials, gemstone globes fit that desire. Between these three, you're sure to find the clockwork globe that would suit your style.